The President regularly attends his daughter's Saturday morning basketball games in a suburban Maryland gym, and this week he stepped in and tried his hand at some coaching when the regular parent volunteer wasn't able to. Sasha, however, wasn't there; she's skiing in Colorado with her mother, sister, and some friends. 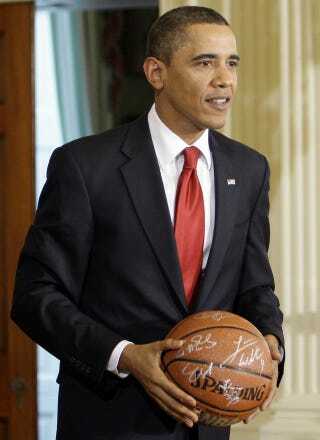 Cameras aren't allowed inside the gym, and thus no pictures of our Girls' Basketball Coach-In-Chief exist, nor do we know whether Obama had them run a triangle two defense against the other team's guard-reliant offense. We also don't know about his coaching style, whether he was more of a simmering, angry Satan like Mike Krzyzewski or a chair throwing Bobby Knight-esque madman or a calm Colonel Sanders Phil Jackson type. What kind of a coach do you think Obama would be?